"JURNAL BIOEDUKATIKA" focuses on the publication of the results of scientific research related to the field of Biology Education. The article published on the internal and external academic community UAD especially in Biology Education. 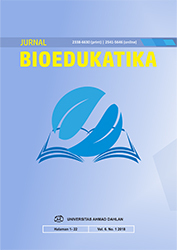 "JURNAL BIOEDUKATIKA" publishes scholarly articles in biology education scope covering: biology curriculum, teaching biology, instructional media, and evaluation. Published article published is the article the results of research, studies or critical and comprehensive scientific study on important issues and current job descriptions included in the journal. "This journal has been accredited by National Journal Accreditation (ARJUNA) Manage by Ministry of Research, Technology, and Higher Education, Republic Indonesia With Second Grade (Peringkat 2, SINTA 2) Since Vol 4 No 1 2016 to Vol 8 No 2 2020 according to the decree No. 21/E/KPT/2018. "JURNAL BIOEDUKATIKA" was published twice a year, on June and December. Article which published in "JURNAL BIOEDUKATIKA" should meet the requirements set by the Editorial Board of the "JURNAL BIOEDUKATIKA". The Editorial Board has the rights has the right to change the editorial and systematics of writing without changing the substance of the manuscript from the author. JURNAL BIOEDUKATIKA is a peer reviewed open-access journal published twice a year (June and December) by Universitas Ahmad Dahlan. Before submission please make sure that your paper is prepared using the journal paper template. Forthcoming publication schedules which are still open for submission is Vol 7 No 1 June 2019, and Other forthcoming issues.